Building on a life dedicated to serving others, Rev. Dr. Jay Barber, president emeritus of Warner Pacific College, is taking on another leadership role as the newly appointed mayor of the coastal town of Seaside, Oregon. On Monday, December 5, Barber was sworn in as mayor, filling the unexpired term of former mayor Don Larson, who recently passed away. Barber and his wife Jan moved to the north coastal town in 2006 and three years later he became involved in the Seaside City Council. Barber’s previous political experience includes serving as a city councilor and two-term mayor in Red Bluff, California. 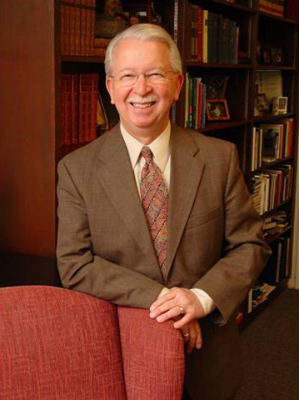 In 1996, Barber became Warner Pacific’s sixth president. When interviewed by the search committee, he said one of the first things he wanted to do as the college’s president was reinstate intercollegiate athletics, which had been discontinued in 1993. “It’s such an important part of the fabric of the campus,” he claimed. Three years later, Barber saw Warner Pacific Knights in action on the field and court. The continued growth and development of Knights Athletics is just one example of Barber’s rich legacy at Warner Pacific College. During his twelve years of leadership, Warner Pacific became debt-free for the first time in its history, enrollment increased dramatically, and the college’s reputation was solidified. On May 30, 2008, Barber retired; however, he didn’t slow down. Sharing his strong leadership, fundraising, and strategic planning skills, Barber was appointed the first Senior Fellow with the M.J. Murdock Charitable Trust in 2008. He also served as a director and two years as chair of the board of directors of Mercy Corps, a relief and disaster organization based in Portland. And recently he served as the interim teaching pastor for the 3,000-member Sunset Presbyterian Church in Beaverton. Warner Pacific congratulates Jay Barber on his appointment as mayor. Warner Pacific College is a private, Christ-centered college of more than 1,400 undergraduates and graduate students in Portland, Oregon. Warner Pacific was recognized as a top college and best academic value in the West according to the 2016 U.S. News and World Report. Established in 1937 by the Church of God (Anderson, Indiana), Warner Pacific offers 29 undergraduate majors and 5 graduate programs in business, education, ministry, and music at 6 campuses across the Portland metropolitan area and online. Warner Pacific provides all students with a welcoming and inclusive space to dream, achieve, and flourish. This entry was posted in All Church of God, Colleges & Universities, Western and tagged city, government, Jay Barber, mayor, Oregon, politics, Portland, president emeritus, Seaside, Warner Pacific College. Bookmark the permalink.